The men and women who experience Our Lady of the Lake University’s innovative programs gain knowledge, skills, and values to lead in fields, companies, and communities. Overview: Our Lady of the Lake University (OLLU), founded in 1895 by the Sisters of the Congregation of Divine Providence, offers undergraduate majors and minors in more than 60 areas of study, master’s degrees in 14 areas of specialization, and three doctoral degree programs. The coeducational liberal arts and sciences institution has an enrollment of about 3,200 students. • Preparing students for success and continued service. Location: Our beautiful main campus is located in vibrant San Antonio, the seventh-largest city in the nation. OLLU also has a weekend and extended learning site in Houston, the fourth-largest US city. Classes are also offered in the Rio Grande Valley at a site in La Feria. Housing: OLLU’s campus in San Antonio offers housing in one of five on-campus residence halls. Private and shared rooms are available, and halls feature common lounges for recreation and study. Halls include free internet access, cable television, microfridges, and laundry facilities. Academics and Programs: Available majors include the arts and sciences, Business and Leadership Studies, Communication and Learning Disorders, Education, Cyber Security, Mass Communication, Psychology, and Social Work. Classes are offered in the daytime, evening, weekend, and online formats. Double Majors/Dual Degrees: OLLU has designed its curriculum to allow students to earn double majors/dual degrees and double minors within a four-year period. Athletics: Student-athletes compete in the National Association of Intercollegiate Athletics (NAIA) in men’s and women’s basketball, cross-country, soccer, and track & field; men’s baseball, golf, and tennis; and women’s softball and volleyball. Intramural and club sports include men’s and women’s basketball, cheerleading, flag football, running, and soccer; women’s clubs include volleyball and dance team. Accreditation: Commission on Colleges of the Southern Association of Colleges and Schools to award bachelor’s, master’s, and doctoral degrees • For questions about OLLU’s accredidation, contact the Commission on Colleges at 1866 Southern Lane, Decatur, GA 30033-4097 or call 404-679-4500. Students can get the most out of their college investment by doubling or tripling the value of their degree at Our Lady of the Lake University (OLLU). The University has made it easier for students to complete two majors, a major and two minors, or two different degrees in just four years—the same amount of time it takes to earn just one major elsewhere. This OLLU advantage is possible through a redesigned general education curriculum that gives students more possibilities to combine their passions with their purpose. Research suggests that by earning a double major, double minor, or dual degree, graduates are more competitive when applying for jobs and graduate schools, have more job market opportunities, are positioned to earn a higher salary, and experience greater long-term career flexibility. By combining majors and degrees, graduates have the benefit of at least three career tracks—one in each degree and a third one from the combined degree. OLLU offers generous scholarship, grant, and financial aid packages to assist families with the cost of a private education. The University works closely with each student to keep quality Catholic higher education affordable and attainable. 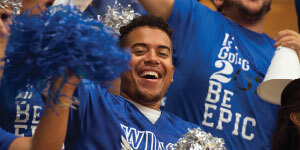 More than 90% of OLLU students receive financial assistance. OLLU believes students should put their skills to work before graduating. The University teams up with community partners to provide paid internship opportunities. Internship partners include Capital One, Citibank, State Farm, Rackspace, and the Westside Development Corporation. Meaningful internships and distinctive service opportunities are hallmarks of the OLLU experience. Faculty design service learning classes and monitor internships to ensure students begin building their résumés and portfolios long before they graduate. Service is ingrained in the OLLU culture. The University maintains a counseling center and a speech and hearing clinic that serve area residents while providing students valuable experience working with real clients. Dedication to service is part of the heritage handed down by the Sisters of Divine Providence, the founders and sponsors of the University. OLLU professors continue the heritage of the Sisters with the service they provide to students. Faculty committed to teaching work closely with students and serve as mentors and advisors. A 10:1 student-faculty ratio ensures personalized attention in classes that are just the right size. OLLU faculty members participate in scholarly activities outside the classroom and enrich classes with their research and experiences. OLLU recently opened a new $15 million residence hall that features apartment-style living overlooking the newly upgraded Lake Elmendorf Park. The residence hall features units with full kitchens and living and dining space. Residents have access to a fitness and yoga center, study lounges, meeting rooms, and a lakeside picnic and garden area. All OLLU residence halls feature free wireless internet access, cable television, and laundry facilities. The friends you make, the knowledge you gain, and the experiences you have at OLLU will last a lifetime. Upon graduation, you will automatically become a member of the OLLU Alumni Association, which will keep you connected to your fellow alums no matter which corner of the world your career takes you. OLLU alumni can be found in careers in all 50 states, US territories, and various countries. Take the first step to a fulfilling academic career and a memorable college experience. Call and schedule a visit or talk to an admission representative.